Newspaper Rock: Fly on Hillary = spirit animal? Fly on Hillary = spirit animal? A tweet from educator Debbie Reese:In Native American culture, all animals are believed to have totems. When they cross your path unexpectedly, they mean something. 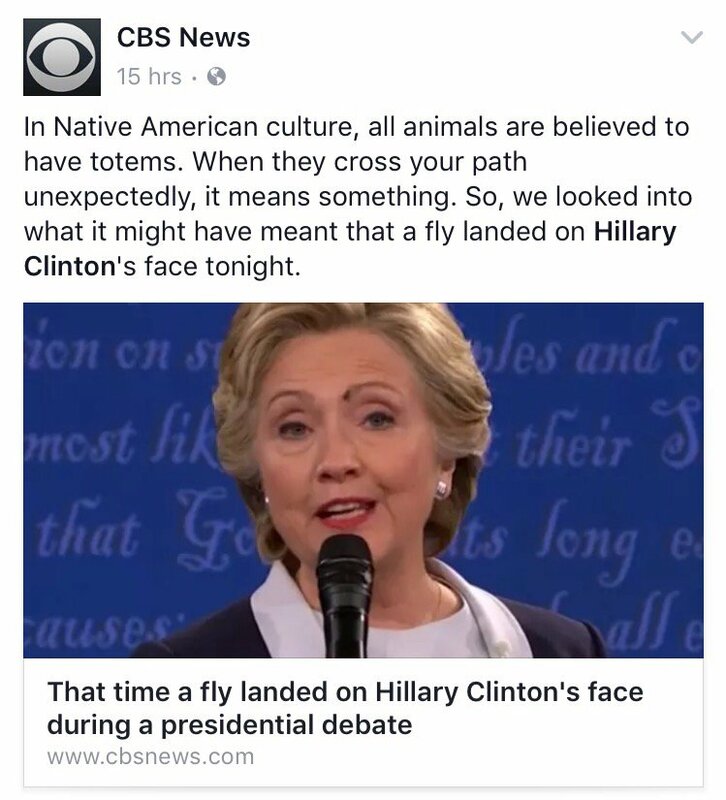 So, we looked into what it might have meant that a fly landed on Hillary Clinton's face tonight.Comment: Reese says CBS News got its info from a New Age website. I believe CBS has garbled an already garbled claim. The fly on Clinton's face has a totem? What would the fly's totem be...another fly? An eagle? Donald Trump? The actual claim, I think, is that all people have animal totems. Not that all animals have totems. Of course, this claim is a false generalization about thousands of Native cultures. It may be true in a few cases--especially in Plains cultures--but I doubt it's widespread. I doubt it applies to everyone even within those cultures.